Contexts of Justice, highly acclaimed when it was published in Germany, provides a significant new intervention into the important debate between communitarianism and liberalism. 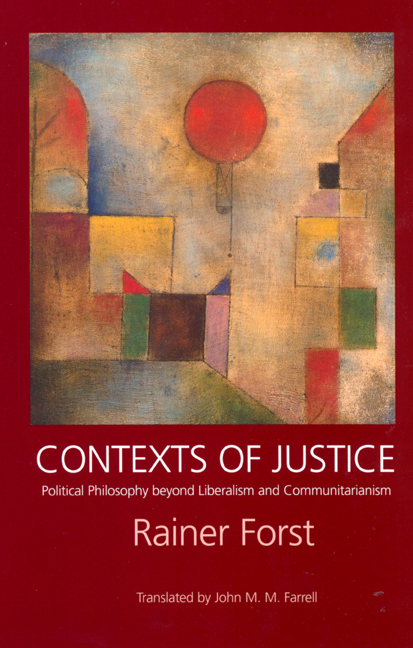 Rainer Forst argues for a theory of "contexts of justice" that leads beyond the narrow confines of this debate as it has been understood until now and posits the possibility of a new conception of social and political justice. This book brings refreshing clarity to a complex topic as it provides a synthesis of traditions and theories that leads to a truly original approach. Forst makes a four-part distinction to decipher the debate between communitarianism and liberalism. These four parts concern the constitution of the self, the neutrality of law, the ethos of democracy, and the opposition between universalism and contextualism. He shows that a comprehensive theory of justice needs to take these different contexts adequately into account. He discusses recent debates about discursive democracy and feminist critiques of liberalism, and addresses such topics as multiculturalism and civil society. Rainer Forst is Assistant Professor at the Institute of Philosophy, Johann Wolfgang Goethe University in Frankfurt. 1.1. The Critique of the "Unencumbered Self"
4.3. Which Person? Whose Reason?